This week's fez is a bit of a tribute. Perched high atop the Bali Hai restaurant in San Diego sits the inspiration. 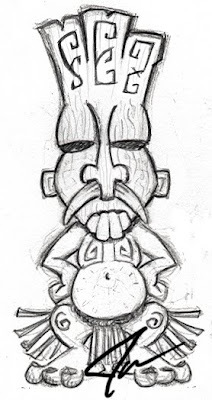 I was really turned off by the grotesque visage when I first saw it and years later when reading Sven A Kirsten's brilliant tome "The Book of Tiki" - an endless source of tiki inspiration- I learned a bit of the history behind the Goof. Well it must have struck a chord because a few months ago this popped up in my sketch book. Clearly the goof had left an impression on the malleable parts of my brain. I suspect that part of the reason I was uncomfortable with the original Goof is how it reminded me of the depictions of the Japanese in the old Warner Bros. propaganda cartoons during WWII. So I transferred the overbite to a mask being worn by the character instead of it being an organic deformation, of course the possibility remains that the wearer is still horribly deformed or perhaps he looks like Clark Gable... that would explain the ears. As for the 3 letter word written across the top of his mask... well, read it again and then apologize to you mother for your dirty thoughts. You should be ashamed of yourself. 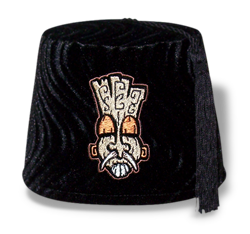 We have a habit of putting fezzes on the characters embroidered on our fezzes but in this case the tarboosh would not work so I went with a less than subtle solution. A very small batch of these have been made and are for sale on our website. If we don't have your size in stock let us know. We will be making more.